Adam, Karl. The Christ of Faith: The Christology of the Church. NY: Mentor, 1962. Bouyer, Louis. The Eternal Son: A Theology of the Word of God and Christology. Huntington: Our Sunday Visitor, 1979. Clark, Stephen B. Redeemer: Understanding the Meaning of the Life, Death, and Resurrection of Jesus Christ. Ann Arbor: Servant, 1992. De Margerie, Bertrand. Christ for the World, The Heart of the Lamb: A Treatise on Christology. Chicago: Franciscan Herald, 1973. Graham, Aelred. 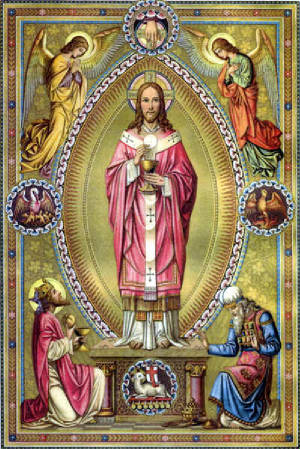 The Christ of Catholicism. London: Longmans, 1947. Ocariz, F., et al. Theology Textbooks: The Mystery of Jesus Christ, A Christology and Soteriology Textbook. Dublin: Four Courts, 2004. O’Connor, James T. The Father’s Son. Boston: Daughters of St. Paul, 1984. Fernan, John J. Theology, A Course for College Students, Volume I: Christ as Prophet and King. Syracuse: Georgian, 1956. Giraud, S.M. Jesus Christ, Priest and Victim. NY: Benziger, 1914. Lebreton, Jules. The Life and Teaching of Jesus Christ Our Lord. NY: Macmillan, 1950. Miguens, Manuel. The Virgin Birth: An Evaluation of the Scriptural Evidence, Second Edition. Boston: Daughters of St. Paul, 1981. Pancheri, Francis Xavier and Juniper B. Carol. The Universal Primacy of Christ. Front Royal: Christendom, 1984. Russell, W. H. Christ the Leader. Milwaukee: Bruce, 1937. Sheed, F. J. The Book of the Savior. NY: Sheed and Ward, 1952. Smulders, P. The Fathers on Christology: The Development of Christological Dogma from the Bible to the Great Councils. De Pere: St. Norbert Abbey, 1968. Adam, Karl. The Son of God. Garden City: Image, 1960. Arendzen, J.P. Canterbury Books: Christ is God. NY: Sheed and Ward, 1927. Bougaud, Emile. The Divinity of Christ: An Argument. Baltimore: John Murphy, 1926. Dreyfus, Francois. Did Jesus Know He Was God? Chicago: Franciscan Herald, 1989.
de Margerie, Bertrand. The Human Knowledge of Christ: The Knowledge, Fore-knowledge and Consciousness, Even in the Pre-paschal Period, of Christ the Redeemer. Boston: Daughters of St. Paul, 1980.
de Torre, Joseph M. Divinity of Jesus Christ. Manila: Sinag-Tala, 1984. Winzen, Damasus. Symbols of Christ: The Old Testament, The New Testament. NY: P.J. Kenedy, 1955.